Stars turn skin white to encourage the minority ethnic communities to register to vote in the upcoming 2015 general election in the UK. Click Here to read more about the ‘Don’t Take The Colour Out Of Britain’ campaign. I’m not sure that this campaign will achieve the desired effect, but it has got a lot of people talking. 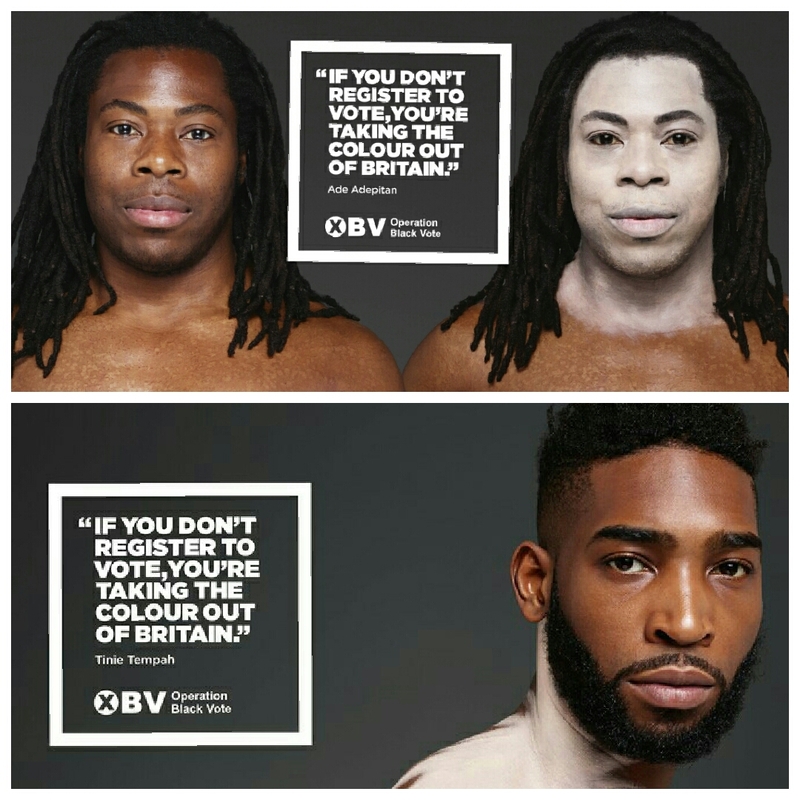 This advert may get people talking, but it certainly will not encourage more black people to vote. How the hell did the people behind this advert ever think that black people dressed up as Minstrels, is ever going to evoke interest. Also the idea that some how that if black people do not vote, they are taking the black out of UK politics. What a load of crap. The black has been systematically taken of Britain, by way of demographics. It’s the same with culture, language and even music…..Even Black History is watered down to the point that it one says the word ” BLACK anything, or even attach the term to a product, it’s considered” RACIST”….. So no! I detest the idea that politicians who avoid the idea of institutional racism, are some of the very people that are looking for Black votes. Let me take it to another level, so many of the Black politicians who are suppose to be representing black issues as much as they can, are often the most silent, once they become elected, only to be shot down, by fellow white MP’s and the media when they do. However the majority are just career politicians, nothing more, nothing less. Now in respect of the people being used in the add, I understand their motives, but I cannot recall them making an political comments, or being on any March or protest of worth. When they do complain, it’s because they have have been shafted, by the system that rejected them……That’s the only time these people use the race card….Yet once they are get there…..They pull up the ” FU” Ladder. In conclusion, the sentiment, behind the add is misguided, and will only garner headlines, not votes. No let me end on this note…If I white people was to black up and say let’s keep the white in UK politics, all hell would be let loose…. Then again, we often like double standards, then claim those in power, should have a much higher standard of behaving….. I agree with all that @Delroy Constantine-Simms said. I understand people use controversial tactics to get attention but that ad is wack. 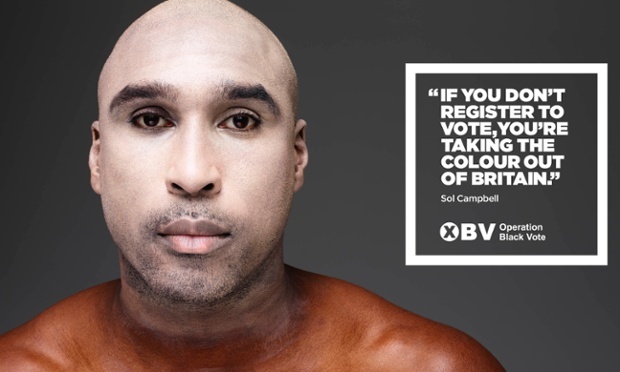 I would really love to hear why some of those stars said yes to that advert and if any of them had doubts…..all except Sol Campbell, not interested in his thoughts at all. LOL Why aren’t you interested in Sol? looool, as arsenal fan it pains me to grow tired of a lot of what comes out of his mouth since he retired. His free to his opinions but i don’t see it for him. This version of him lately is not what i thought he was. I hear you. My question is why didn’t he express these opinions when he was still playing? I don’t remember him being this concerned about racism then. I feel like its because he had it good in football (in his head) and he looked like the type to stay out of the media light in general. But i just don’t feel any real intent in what he has said since his retirement, it feels like everything he has said and done since is all his and Sky Andrews way of making him relevant after football. LOL I totally agree with you.